Ring Pro vs. Nest Hello: Which Smart Doorbell System Is Best? Ring Pro vs. Nest Hello: Which Doorbell Camera Is Better? The Nest Hello and Ring Pro seem similar at a glance. But dig a little deeper and you’ll see that the Nest Hello outshines its main competitor with more reliable performance, superior video quality, and better features. Data effective 2/8/2019. Offers and availability subject to change. The Nest Hello and Ring Pro both come with 1080p resolution and a 160º field of view, so they’re comparable in their video performance. But there’s one key difference. The Nest Hello has HDR, which layers multiple images with different exposures. So sunny spots aren’t too bright and shaded areas aren’t too dark. The Ring Pro and Nest Hello both offer infrared night vision, and they perform more or less comparably in the dark. Both cameras look clear at night and give decently good contrast on details like faces without washing them out. We really like the Nest app. It’s easy to use and integrates with any other Nest equipment you have in your home. With the facial recognition ability, you can assign profiles to different faces in the app. That way your Nest won’t just tell you someone’s at your door, it’ll also tell you whether or not it’s someone familiar. We also like that the Nest offers continuous recording. If your Wi-Fi network is up to the task, you can ensure you’ve got a recording of any deliveries, visitors, or mischief at your home. Our favorite Ring video doorbell feature is the ability to set zones for the motion sensors. If you live on a busy street, you can set the motion sensors to ignore everything but your yard, porch, or front door. The best part is you don’t need to pay for a plan to access Ring’s zone-setting feature. We also like Ring’s Neighborhood Alert feature, which lets you see footage posted by other Ring users in your area. The Nest Hello outshines the Ring Pro with its array of useful features. We like the Nest app more—especially if you have other Nest equipment. If you don’t have wiring in place, you’ll likely need the help of a professional installer to run new wires to your front door. The Nest Hello and Ring Pro both require a hardwired setup that can be complicated if you don’t already have the wiring in place for a traditional doorbell. If you don’t have wiring in place, you’ll likely need the help of a professional installer to run new wires to your front door. 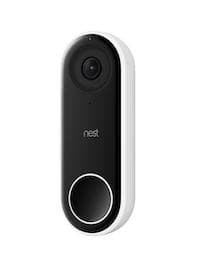 In this instance the Nest and Ring about break even, but Ring offers some wireless doorbell cameras if you’d prefer not to deal with a tricky installation. Whether you opt for the Nest or Ring video doorbell, we recommend getting a plan with your smart doorbell. You’ll need a plan to unlock all the features you’ll want with your doorbell camera. But Nest and Ring plans are structured a little differently, and frankly, Ring’s Protect plans gives you better features at a lower price. Nest Aware ranges from $5 per month to $30 per month and gives you 5 to 30-day video history, continuous video recording, intelligent alerts, clips and timelapses, and the ability to set activity zones. You’ll also need a plan to use the Nest Hello facial recognition feature. Ring’s Protect Basic plan starts at $3 per month and gives you 60 days of video storage and video-sharing abilities. Most of the other features you’d want, like custom motion detection and on-demand video, come for free. So if you don’t think you need the 60 days of video storage, the Ring Pro would still work without a plan. If you want to save money on a plan, Ring gives you more features with its basic plan. Although the Nest Hello and Ring Pro seem to compete neck and neck on the surface, we give the edge to the Nest Hello. Not just because it performs more reliably during everyday use, but also because it gives you nicer-looking video, superior night vision performance, and cutting-edge features like facial recognition. If you want a more reliable smart doorbell with better features, go with the Nest Hello. There’s a reason the Nest Hello is our favorite doorbell camera. It performs better day-to-day and comes loaded with better features than its competitors. If you care more about Alexa integration or running your smart doorbell without paying for a plan, go with the Ring Pro video doorbell. While the Ring Pro doesn’t quite live up to its competitor in the Nest Hello, it still has its advantages. Most notably, you still get plenty of features if you don’t want to pay for a plan. Not sold on either the Nest Hello or Ring Pro? Take a look at some of our other favorite video doorbell cameras.